The router is a troubled gadget. Despite its importance, a router is often the most boring device you can usher into your home. The Amplifi solves that by being one of the fastest, easiest to use, and most attractive routers available. But you’ll need $200 to invest in this guy. The price might seem steep compared to other routers out there. And indeed, if you live in a tiny apartment with clear lines of sight from the router to your computer, the $70 TP-Link TL-WDR3600 might be better. However, most people have at least one dead zone in their home, and most people don’t want another big ugly machine with antennas sprouting out the top that looks like a sharp-angled cockroach. There’s a 4-port ethernet switch on the back, as well as a USB 3.0 port. The device is also powered via Micro-USB. The router is attractive, with a sleek design in the style favored by the new class of crowdfunded routers flooding the marketplace. Despite the soft-touch plastic and gentle curves of the cube, this guy isn’t from some flashy startup out to “disrupt” the router industry. It’s from Ubiquiti Networks, an enterprise networking company that supplies Wi-Fi gear for corporations and the huge radios that give much of rural America its internet. There’s no crowdfunding, no waiting on supply chains. You just buy the router and enjoy 24/7 support, which I pestered at 2am without incident. 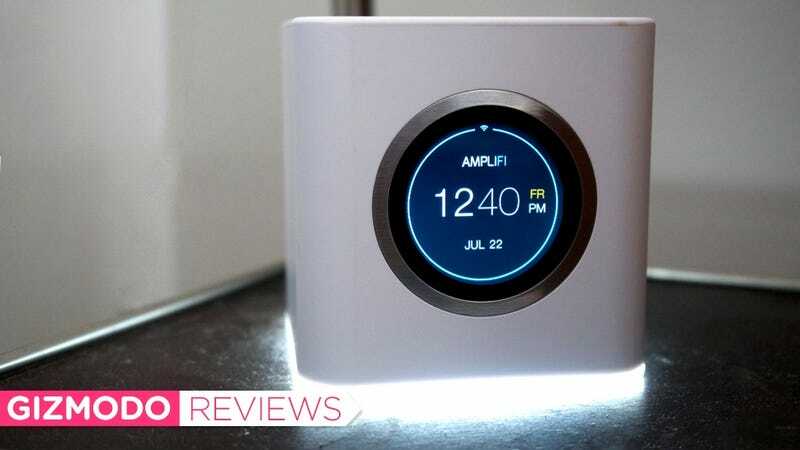 For $200, the Amplifi includes a small, unobtrusive router with a touchscreen which can display either the time, throughput, or IP address, as well as two mesh router extensions that plug directly into the wall and require next to no effort to set up. Surprisingly, the small router, which is free of garish antennas, has fantastic range. It deftly filled spotty holes in my home that my previous router, the Asus RT-AC68U, could never fill and The Wirecutter’s own testing backed up my experience, with the device hitting 20 Mbps on Wirecutter’s most strenuous test, and 150Mbps in general use. The Eero, for comparison’s sake, managed .75 Mbps and 135 Mbps respectively. The mesh point can be adjusted and connects to power pack via magnets. So there’s no accidentally snapping it off. Plugging in the mesh points improved that already impressive connectivity further. Without them I could make it to the end of my block, about 100 feet away, and hover between one and two bars of Wi-Fi service on my phone. With the extension, I still had the coveted three bars, and that was through a foot of brick! Our friends at The Wirecutter did notice one issue with the Amplifi—if you’re in a railroad style apartment you may have some issues using the meshpoints, as the router had trouble distinguishing between them when they’re placed in a straight line. But that’s a solution easily solved with a software patch, and one of many the Amplifi could see this year. The pre-release version of the Amplifi that I tested didn’t have a way to adjust settings on the router via the web. (I’m told that feature will be there when it ships to consumers August 1.) So everything is done on your phone, and setting up and maintaining a router using a mobile app can often be a cruddy slog. Apart from a few hidden menus that only the power users will want to hunt down, the Amplifi app is easy to use and attractive. It’s got a built-in method of testing speeds and quickly diagnosing issues, and it connects to your phone not just via wi-fi, but also via Bluetooth. That means there are no hang ups when you first set the router up, and you can always access it, even if it stops broadcasting wi-fi. The Amplifi is an AC router running 2x2 MIMO. That means it runs very fast and works very well with any and all tech you need to connect via wi-fi. However some people use a lot of tech, and they need significantly more bandwidth. So there’s also an Amplifi HD equipped with 3x3 MIMO that goes for $350. How do you know if you need to go up $200 in price? Here’s a rule of thumb—if you have no idea what the difference between 2x2 and 3x3 is, then you do not need the Amplifi HD. For most people the $200 Amplifi is a perfect router. It’s a little pricier than some of the competitors, but when you factor in the included mesh points, great design, and the excellent tech support, it’s a no-brainer. If you need a new router, this should be at the top of your list. Both the Amplifi and Amplifi HD are available for sale now from their website, with the Amplifi shipping August 1 and the Amplifi HD shipping in September. CORRECTION: The review originally stated the price was $150. It has been updated to note the actual price, $200.